Islamists are creating a nightmarish Sharia-run state in northern Mali, complete with public floggings, group amputations, and death by stoning. The Islamist group Ansar Dine (Defenders of Faith), along with its other Islamist and al-Qaeda allies, is creating a terrifying Sharia-run state in northern Mali, complete with public floggings, group amputations, and death by stoning. 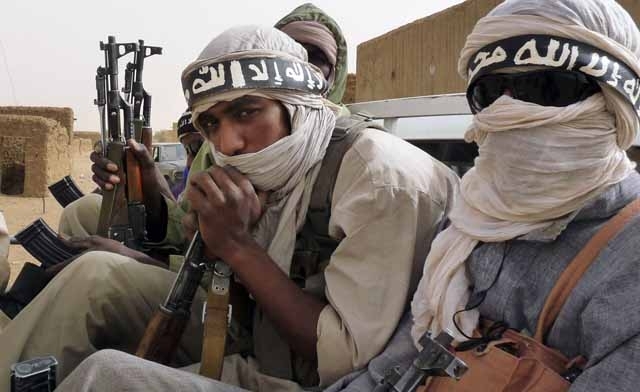 Ansar Dine, along with the Movement for Unity and Jihad in West Africa (Mujao) and al-Qaeda in the Islamic Maghreb (AQIM), first gained control over northern Mali in April after it commandeered a rebellion originally launched by ethnic Tuareg separatists against the Mali government. Since then, as part of their consolidation of power in the region — an area roughly the size of Texas — the Islamist Ansar Dine and Mujao have been busily imposing Sharia law in the towns and cities of northern Mali, including the region’s largest cities of Timbuktu, Kidal, and Gao. To that end, the Islamists have issued edicts against a wide range of acts they deem to be “haraam” (forbidden), behaviors such as smoking or selling cigarettes; drinking or selling alcoholic beverages; listening to music; failing to attend daily prayers; or women failing to cover themselves appropriately. For those unfortunate enough to run afoul of these restrictions, the punishments are exceedingly harsh, punitive measures which include public beatings, floggings, amputations, and summary executions, such as death by stoning. Carrying out the punishments are designated Islamic police, assisted in their tasks by a growing cadre of child soldiers, some as young as 11, who have been recruited into the Islamist ranks to serve as spies, guards, cooks and patrol officers. For some, punishment is extra judicial, swift and on the spot, with men and women taken directly off the streets by the Islamic police and whipped and beaten in marketplaces and in public squares, beatings which are often administered by the child soldiers. For those spared an out of court public beatdown, they are instead given an Islamic “trial,” a hearing before a panel of judges selected by the Islamist authorities — many of whom are foreign Islamist fighters — in which the accused is given a chance to tell their version of events. The verdicts given in these Islamic “courtrooms” are often handed out the same day the trial begins, with the designated punishment, be it flogging, amputation, or execution, carried out immediately in public view before the mandated attendance of the local populace. Of course, figuring what type of punishment is appropriate for the crime committed is determined by the nuanced complexities of Sharia law, intricacies explained by Oumar Ould Hamaha of the Mujao in the recent case in Gao of a group amputation in which the right hand and left foot of five suspected thieves were cut off. While theft may result in the loss of several appendages, it’s a markedly better punishment than for those accused of having children out of wedlock, as was the case of a young couple who was stoned to death in July by members of Ansar Dine in the Malian town of Aguelhok near the Algerian border. The Islamists brought the young man and woman into the center of town and forced them into holes about four feet deep, with their heads protruding, and then stoned them to death before a silent crowd of 300 people from the village who were forced to watch the barbaric execution. As hard as it may be to believe, however, it has been reported that the Islamists were in the beginning days of their takeover in northern Mali actually “lenient” in their treatment of women, preferring to direct most of their judicial wrath at men. Apparently, however, that strategy has failed to ensure full Sharia compliance among the Malian populace, so the Islamists are now specifically targeting women. For example, in the city of Timbuktu, many women were wearing light veils that covered part of their hair, but the cloth, often white, was transparent, a transgression so severe that Ansar Dine, who controls the city, began demanding women wear black and much larger veils to cover their entire heads. The new dress code, however, has had some unfortunate effects, especially for one pregnant woman who was going into labor. Arriving at the hospital wearing an outlawed white veil, the women was ordered by the Islamists to go home and change, a task she couldn’t complete and she ended up giving birth on the sidewalk outside the hospital. In addition to changing women’s head apparel, the Islamists, outraged at the form-fitting attire worn by young women, also banned tight clothes, requiring that women wear on top of their regular clothes, “toungous,” large flowing dresses traditionally worn in the African Sahel. While women in Timbuktu who fail to abide by the Islamic dress code are currently being beaten with sticks by Islamist police, Ansar Dine has announced that it will ratchet up the penalty for any woman who disobeys their new rules by having their ears cut off before sending them to a new, all-female prison. Unfortunately for the citizens of Timbuktu, Ansar Dine’s heavy Islamist footprint has already been deeply felt, as it has systematically destroyed the city’s numerous religious shrines, mausoleums, and cemeteries, sites which hold significant cultural, historical and religious importance to the Malian people. Yet, sadly, for the people of northern Mali, it’s a cultural heritage that Ansar Dine and its Islamist and al-Qaeda allies are working feverishly and lethally to keep from ever being resurrected.